Incorporating EI Travel, Extreme Ireland Adventures, Irish Day Tours, Tourist Office Dublin, The Irish Whiskey Museum and – the newest addition - The Riddler Restaurant, EI Travel Group is at the forefront of Irish tourism and adventure travel. At the heart of the multifaceted and progressive operation is a stunning fleet of 30 vehicles. We caught up with director Mike Murphy to find out more. Between its six separate strands, which all function together as part of a unique and all-encompassing whole, EI Travel Group is a vibrant young enterprise that prides itself on energy, enthusiasm and professionalism. Offering a wide variety of tours, coach services, adventures and other travel-related activities within and outside Dublin, EI Travel operates a magnificent fleet of modern, immaculately-maintained coaches, buses and limousines, manned by experienced, friendly and fully-qualified personnel. A reliable and professional transport provider, EI Travel has been leading the tourism and transport market in Ireland for a number of years. Priding itself on professionalism, friendliness and customer service, it’s the only company in Ireland to have the EFQM customer service award. Experts in all passenger transport - from logistics, pre-planning and customisation of journeys through to efficient and economical execution – EI Travel is a sustainable, responsible and environmentally-friendly company specialising in private hire, day tours and multiday tours around Ireland. They run a fleet of 30 buses ranging from six to 63 seaters. The size and diversity of the fleet means they can cater for any group size for a wide range of solutions including tours, airport and hotel transfers, college and school outings, sports events, business trips and conferences, limousine services, etc. – all with a guaranteed professional and personal touch from start to finish. EI Travel understand that reliability is high on clients’ agendas. Thus, drivers are well briefed on the importance of punctuality and customer service. Meanwhile, working from a modern, fully-equipped workshop in Western Industrial Estate, a service team of three mechanics makes sure that all vehicles are in optimum condition and well serviced, with all coaches cleaned inside and out at the end of every excursion. McElvaney Motors (Scania) and Cronin Coaches (DAF) uokeep the newer vehicles. Extensive reinvestment in vehicles and premises reduces overheads and, due to the large size of the bus fleet and the high volume of work the company undertakes on an ongoing basis, they can price all bus hire quotations very keenly. Meanwhile, Extreme Ireland Adventures offer a variety of walking tours, soft adventure tours, day tours, adventure courses and international adventures. Having started from humble beginnings with two small mini buses and four people, Extreme Ireland offers rich vacation experiences designed for inquisitive travellers, its unique journeys combining challenge and adventure with the finest creature comforts. The leading day tour operator out of Dublin, Irish Day Tours, which was set up to provide quality tours of Ireland delivered by knowledgeable guides, currently offer seven day tours out of Dublin city 364 days of the year. The success and exceptional growth of this company can be credited to a relentless focus on customer care and service and they have been awarded the ‘Certificate of Excellence’ for 2012, 2013, 2014, 2015 and 2016 for outstanding customer reviews. 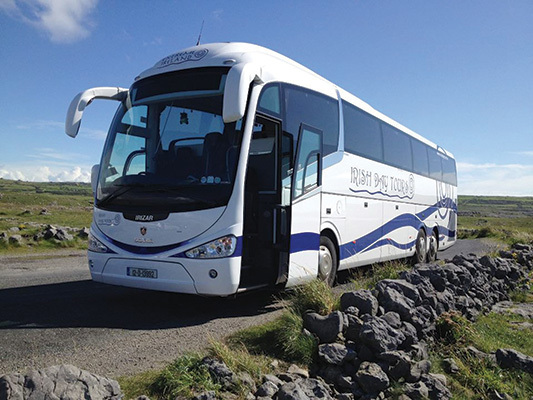 Day tours out of Dublin daily have been carefully handpicked for their historical, natural and cultural importance, running to The Cliffs of Moher, Giant’s Causeway, Belfast & Northern Ireland, Celtic Boyne Valley, Cork & Blarney and Connemara. Tourist Office Dublin is the first-choice, one-stop friendly online tourist shop based in Dublin. The best place for tourist information, day tours from Dublin and visitor attraction tickets, they also provide airport transfers on request and have a left luggage facility. Top attractions include the Guinness Storehouse Tour, The Gravedigger Bus, The Storyteller Bus (Ireland’s only custom designed storytelling bus for an evening or traditional myths, legends and fun), James Distillery, and Experience Gaelic Games as well as a wide range of day tours to all of Ireland's iconic tourist destinations. Serving high-quality cuisine, the chefs at The Riddler Restaurant – which opened for business on December 22nd, 2016 - pride themselves on producing innovative modern Irish dishes utilising fresh, locally-sourced, seasonal ingredients. With all of their coffee beans locally-roasted by the independent shop, Two Spots, their liquors distilled in Ireland, and numerous nods to Irish traditions, media, and culture throughout the interior landscape, The Riddler is not just about Irish food but about connecting or reconnecting with our roots. Last but by no means least, The Irish Whiskey Museum is an interactive, ultra-modern tour offering an experience unlike any other in Dublin. Guests can journey back through time and discover the intriguing tale of Irish whiskey, its unique origins, its rise to glory, dramatic fall and current revival in a truly fantastic museum. Between the six companies, gainful employment is generated for a team of more than 110, with additional restaurant staff due to be taken on at The Riddler imminently. “We currently run 30 vehicles, including four limousines and the two themed double deckers as well as the coaches and mini coaches,” notes director Mike Murphy, who is a brother of IRHA president, Verona Murphy. One of the most impressive things about EI Travel Group is that it incorporates such a broad and varied range of companies, which – through the common link of tourism, transport and hospitality - function effectively either on their own or as part of the overall group. “Extreme Ireland was the starter company in 2006, when Keith [McDonnell, MD] wanted to get out onto the hills and into the outdoors. By 2008, he had gone full-time with the hiking and holidaying etc. Within twelve months, a 16-seater and 33-seater were added to the original eight-seater Caravelle. “In 2009, the day tours started from Dublin to the west – rather than just to Wicklow or close to home - and we were bucking the trend by doing twelve-hour tours. All money has been reinvested and the Group has grown organically. This growth has been extremely encouraging – last year we carried 113,000 people all in. “The Global Passenger Network (GPN) only has one representative from each country and we are proud to be their Irish representative and to have hosted their ten-year anniversary last year. We’re also the only Irish tour operator to have an EFQM service excellence award. As for the challenges going forward, Mike is determined to help merge the six companies within the group together as seamlessly as possible: “EI Travel Group – as a group – is really a new concept that’s been born within the last six-twelve months,” he concludes. “Each cog has to facilitate the others so that they all complement each other by working in unison and pushing in one direction. Yet another string to the mightily impressive EI Travel Group bow!